Which tipster will land the coveted TOTP trophy? And so it all comes down to this. One match, one moment, one chance at claiming eternal glory and the Take on the Professor trophy. So, quite a lot at stake then in this campaign finale. After a season’s toil we’re left with two of the finest internet tipsters the world has ever seen (too far?). The not so small matter of FA Cup final between Crystal Palace and Manchester United is the subject in question. To be fair to John he’s made it this far so who are we to scoff at his tipping? What do you reckon? 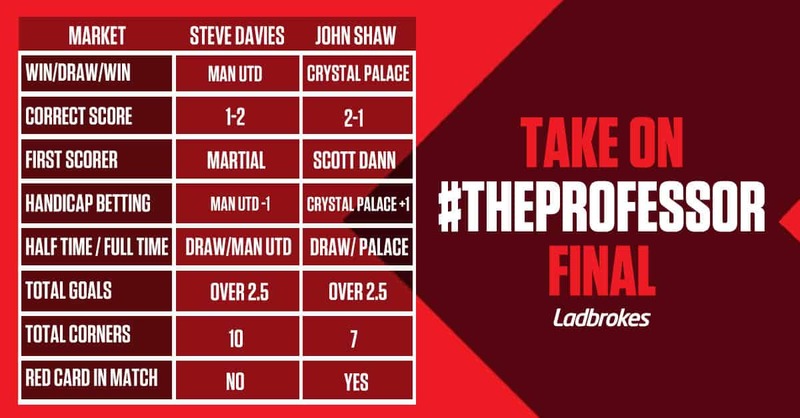 Let us know your thoughts via @Ladbrokes! – One chosen fan blogger, will be contacted and asked if they’d like to take part before receiving their £25 FREE BET and choosing their selections. – Ladbrokes News Team will then inform the participant of their selections so that both parties are fully aware of what’s been chosen in advance to kick off. – After the chosen game we will add up scores and make the blogger aware of the outcome in a news story. – Scores will be settled based on the pre-match odds given directly before kick-off of the stated game. – The four semi-finalists will go head-to-head in a knockout format to win the Take On #TheProfessor trophy at the end of the season. – The chosen candidate will have 24 hours to get back to us with their selections before we look for another contender. – The promoter is Ladbrokes Sportsbook LP, a limited partnership registered in Gibraltar, number 44, whose registered office is 57/63 Line Wall Road, Gibraltar.